July 2016: Patrick successfully defends his thesis. He is headed to Gregg Beckham's group in NREL, Golden, CO in September. July 2016: Our collaborative paper with Prof, Na Wei's group (Notre Dame) on surface display of laccases for environmental remediation is online. It was published in Environmental Science and Technology. Read it here. June 2016: Yuexiao successfully defends his PhD. Congratulations! May 2016: Our paper on the EM structure of Gluconacetobacter hansenii (formerly acetobacter) cellulose synthase (AcsAB) is online. Read it here. May 2016: Our diffusiophoresis review with the Velegol group is published in Soft Matter. Raj and Manish are coauthors. Read it here. April 2016: Boya's paper on microfiltration of frack flowback water is published in Water Research. Check it out here. April 2016: Hasin wins first prize at the College of Engineering Research Symposium. Congratulations Hasin! April 2016: Our paper on using engineered self-controlled biofilms to fight biofouling on reverse osmosis (RO) membranes was accepted to PNAS. Raj is co-first author, Li and Mike Geitner are co-authors. Details of project here. Paper is available for download here. April 2016: Our collaborative paper with the Mihail Barboiu group at CNRS, Montpellier, France on I-quartet water channels was accepted to JACS! Yuexiao is co-first author. Check it out here. November 2015: Akhila, Megan and Tyler join the group as graduate students. Check out their profiles on the People page. August 2015: Yuexiao's artificial channel paper is online. This paper is on testing an artificial water channel that has permeabilities approaching those of aquaporins and was published in PNAS. Check it out here. ​July 2015: Undergrad Stanley Chan wins the Astronaut Scholarship. Check out the news story here. June 2015: Yuexiao wins the NAMS graduate student fellowship and the Poster session first prize! April 2015: NSF awards a GOALI project to our collaborative team with Prof. William Phillip at Notre Dame. See details here. April 2015: Kevin's Moringa paper is online in Langmuir. See details here. This paper describes the molecular mechanism of membrane damage caused by the cationic protein from Moringa seeds. Also see news coverage here. 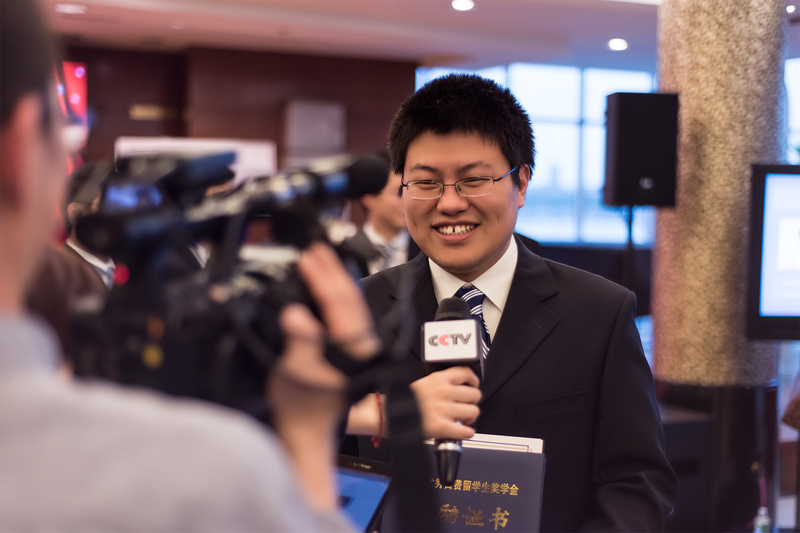 ​November 2014: Yuexiao wins the AICHE Separations Division Graduate Student Award. See PSU news story here. September 2014: Patrick wins the EPA STAR Fellowship! Congratulations. See PSU news story here. August 2014: Undergraduate student Stanley Chan receives the NASA Space Grant Scholarship. Details here. August 2014: Our Advanced Materials paper on 2D crystal based Photosystem I solar conversion devices is online. This is a collaboration with the Golbeck, Mallouk and the Bazan groups. May 2014: Yuexiao is selected to present as one of the 8 graduate students nationwide at the Council for Chemical Research (CCR) meeting. April 2016: Yuexiao receives the Chinese Government Award for Outstanding Students Abroad! See announcement here. Also here is a picture of Yuexiao being interviewed by news media. ​March 2016: Megan receives an Honorable mention for her application the NSF Graduate Research Fellowship Program. Congratulations Megan! March 2016: Undergraduate researcher Emelia Conte from our lab receives the prestigious Larry Duda Undergraduate Research Award! Congratulations Emelia. March 2016: The group has received a new grant from the Army on studying I-quartets as water channels in block copolymer membranes. March 2016: Manish receives the NSF CAREER award. Read PSU announcement here. This work will focus on developing pillar[n]arene channel-based membranes for water treatment. March 2016: Hasin's paper has been accepted to Biotechnology and Bioengineering. This paper describes how membrane proteins can be concentrated without concentrating detergents. Read the ASAP version here! March 2016: Harrison’s paper is online. This paper is in collaboration with Prof. Mike Hickner’s group (Penn State) on ion exchange membranes and was published in the Journal of Membrane Science. Read it here. January 2016: Our first paper of the year is online. This paper is in collaboration with Prof. Meagan Mauter’s group at Carnegie Mellon and was published in JACS. Patrick is co-first author. Read it here. January 2016: Kumar group high school researcher Gianmarco Terrones wins recognition as a semifinalist in the Intel Science Competition and is a National Merit Finalist. See news story here. He has also been accepted to Caltech! May 2015: Welcome Summer Research Students! A collaborative paper on testing biomimetic membranes with Applied Biomimetic. Boya's paper on recovering carboxylic acids from acidogenic digestion using Nanofiltration. Raj's paper demonstrating the significant role of diffusiophoreiss in RO sytems. May 2014: Manish is co-directing the new REU program (Integration of Biology and Materials) with Dr. Esther Gomez. We start this month. March 2014: Our group receives a couple of NSF grants. The definition of a good week! A collaborative project with Dr. Thomas and Tammy Wood on engineering biofilms to fight unwanted biofilms. A collaborative project as a part of the MAGIC consortium (also funded) to develop ways to make photosynthesis more effective in C3 plants. Diffusiophoresis in membrane systems in Langmuir. A comprehensive review on Biomimetic Membranes in Journal of Membrane Science. 9th March 2013: Samantha Summers was awarded one of this year's Undergraduate Research Scholarships in the Department of Chemical Engineering (the Biofellowship). Congratulations Sam! 6th December 2012: Our team (Yuexiao, Patrick, Bryan, Mustafa, and Manuel) are runners up in the Dow Sustainability Innovation Challenge. See more details here. Great job! 5th November 2012: Ashley Edwards from our group wins the Myriant Corporation Scholarship in Bio-Energy and Energy Sustainability. More details here. 22nd October 2012: Hasin Feroz and Ben Schantz join our group. Welcome! More details on their accomplishments on the People page. 9th April 2012: Yuexiao wins the American Water Works Association’s Larson Aquatic Research Support (LARS) scholarship. the LARS scholarship provides support for doctoral and masters students interested in careers in the fields of corrosion control, treatment and distribution of domestic and industrial water supplies, aquatic chemistry, and/or environmental chemistry. 7th October 2011: Patrick Saboe and Yuexiao Shen join the Kumar lab. Welcome Patrick and Yuexiao. Read more about them on the People page. 31st August 2011: Manish presented our research on developing flat Aquaporin-rich membranes at the ACS fall conference in Denver in a special session titled “ Polymers for Water Treatment”. There audience was quite receptive and excited about the idea with many questions and a prolonged discussion on strategies to scale such membranes. Abstract on Publications page. 1st August 2011: Manish Kumar joins PSU and is excited to start his lab. He would like to get two students to join his lab this semester and undergraduates interested in biology and soft materials science. The two projects that I am offering to current graduate students are listed on the Research page.